Ignacio Czeguhn studied law at Julius-Maximilians-Universität Würzburg. His doctoral thesis entitled “Die kastilische Höchstgerichtsbarkeit 1250 bis 1520” was awarded in 2001 with the Preis der Vereinigten Stipendien- und Preisstiftung der Julius-Maximilians-Universität Würzburg. In 2006 he habilitated on civil law, German and European law and constitutional history as well as comparative law history. Since October 2009 he has been professor for civil law, German and European as well as comparative law history at Freie Universität Berlin. 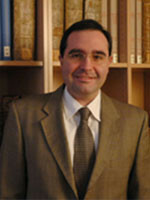 In Topoi he is member of research project (B-1-2) Water Law on public law legislation regarding the access, use and protection of water on the Iberian Peninsula. These investigations comprise the time period of the Roman rule (218 BC to 476 AD) followed by the Visigothic empire (Toledo 554-711) up to the Islamic invasion. For the first time, Islamic law is investigated concerning the matter water. Since the development of the subject from 3rd century BC to 9th century AD shows results up to today (water courts in Valencia and Sevilla) the project shows relevancies to present time. Lässt sich eine Kontinuität in Regelungen über Instandhaltung und Renovierung von Straßen und Wasserleitungen auf der iberischen Halbinsel in römischer und islamischer Zeit feststellen? Existe-t-il une continuité des règles d’entretien des infrastructures routières et hydrauliques dans la Péninsule ibérique entre les époques romaine et islamique?